My daughter loves books and loves pointing to things on the books. She has a board book with a whole bunch of circles. Yesterday she pointed to a circle said "what is it?" then said "circle!". She learned that from the Sparkabilities app that she has been looking at since she was a few months old. I was pretty proud that she recognized the circle without me pointing it out. I took out the flash cards I had purchased for her and saw if she could recognize anything else. She just took them all out of the box and put them back in until she got bored of them and threw them on the floor. She wasn't interested in looking at them at all. I think the reason why is that they were too busy. Too many colors and characters on them. I set out to make some simple flash cards with just a shape or color and one word in black and white. She loved them! She automatically recognized the circle and diamond. We are now working on the colors and other shapes and she seems super interested. If you just want to print the ones I made you can save the .PDF file below onto your computer. Click on the link, Download, then Direct Download. Save onto your computer where you can easily find it. Then Open the file, press File.. Print and pick the Fit option. I made them using my favorite software Paint Shop Pro 9 (yes I know it is super old but I love it!) I made a new image that was 8 x 11. Then added black lines to separate the image into 12 boxes. In each box I added a shape or a square of color. I then added the word that described each box. Next I converted it into a .PDF file and printed it out on 110lb card stock paper. I love card stock because they are a lot more durable than just regular printer paper. I always have it on hand to do tons of other craft projects. Then I just cut out the squares and let my daughter have fun with it for a little bit. After she gets the fun out of playing with the cards you can now start to point and repeat the words. 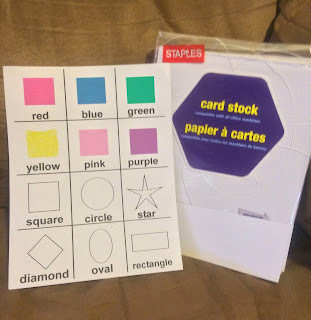 If anybody is interested in more flash cards I'll be more than happy to make another post with different cards like different colors and shapes. Or anything else you can suggest. Great idea! I am going to pin this! I love DIY school projects! Thanks! Oh that's awesome, I never thought to make them. These look like a fun way to teach the kids. I love printables! I print out all my greeting cards & stuff for school as well. Flash cards were the easiest way for me to learn math as a kid. 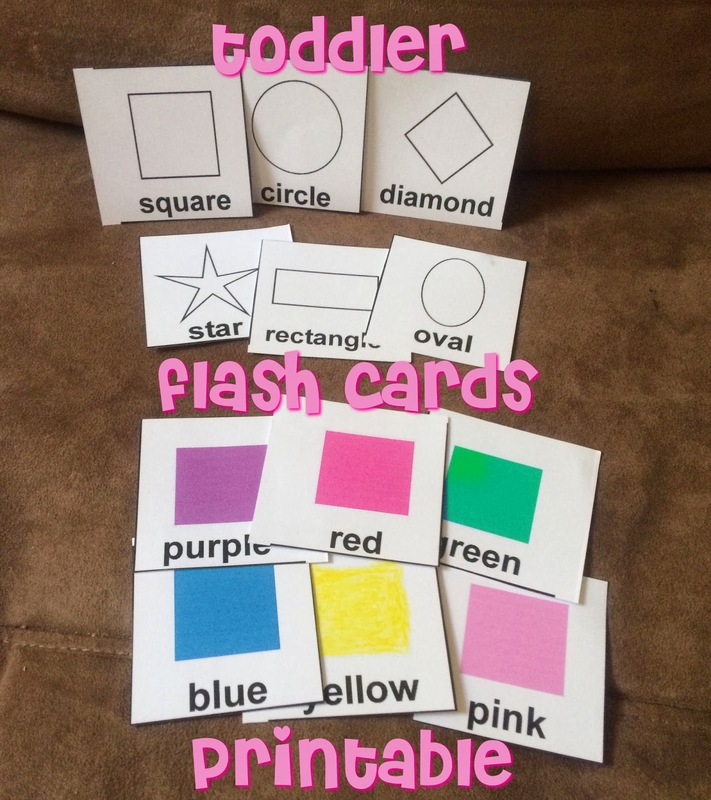 Perhaps some addition & subtraction cards would be a useful next post of flash cards? These are great! I could really use these with my son. Our printer is kind of hit or miss about whether it's going to work, but I might be able to print it at the UPS store...I think it'd still be more cost effective than buying flashcards. Thank you for the link. My daughter is already in reception, and these will be very helpful.